Make your own handmade rugs to enhance rooms and serve as focal points on their own. Make an elaborately crafted rug if you know how to a weave wool tapestry with a large floor loom. Take on a moderately difficult project by designing a hooked rug. Or spend your time and energy on the design rather than the execution by stitching together a creative assemblage of carpet samples or painting a design on an existing rug or a sheet of canvas. Whatever your approach, making your own rugs gives you the ability to choose sizes, colors, textures and patterns. Weave a wool tapestry. Attempt this challenge if you are intrigued by the long tradition of woven rugs and have access to a floor loom. Purchase a floor loom from a craft shop that specializes in weaving. Take a course on rug weaving. Consider a week-long learning vacation at a school that specializes in teaching how to craft handmade objects that require high skill levels. Read magazines that showcase creative handmade rugs such for inspiration. Latch hook a design. 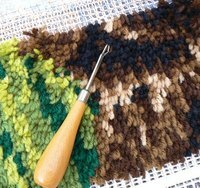 Visit a craft store to examine the kits available that include a hook, yarn and a printed background to make a rug. Imagine the modifications you could make to the design. Buy supplemental yarn in the same weight as the yarn in the package in the colors you need to make the modifications. Buy a blank hooking background and yarn to invent your own design. Hook the yarn through the holes to secure it following the package instructions. Hem a piece of canvas. Buy canvas material in any size and color that appeals to you. Browse the selection available at fabric stores to get ideas. Purchase it at least 6 inches larger than the size you need to allow room for shrinkage and hemming. Shrink the canvas by spreading it on a surface that will not be damaged by water and scrubbing it with a sponge full of hot water. Allow it to dry completely then hem the edges by folding them under about 2 inches on each side. Iron the folds sew the hems using a machine outfitted with a heavy needle. Paint the hemmed canvas with latex paint if desired. Allow it to dry completely. Paint several coats for a sturdy rug that resists soiling. Add stripes, patterns and shapes using masking tape or stencils, or improvise an image freehand. Stitch a patchwork rug from existing small carpets or samples. Collect carpet samples from showrooms or buy small kitchen rugs, doormats or even heavy placemats in colors and styles you like. Tie them together at the corners using grommets and heavy string, or stitch a large cross-stitch seam out of wool yarn using a tapestry needle for an additional design feature.